Size matters but, in this case at least, smaller is better. That’s the basic message given to anyone contemplating the Introduction to Caving tour offered at Mammoth Cave National Park. The tour, one of the most strenuous offered, takes a small group to crawl, twist and squirm through undeveloped parts of the cave. A restriction limiting hip and chest dimensions to less than 42 inches is supposed to prevent soft tourists like us from getting wedged in the tight spaces we’ve volunteered to go. We’ll see about that. The other requirement is for all participants to wear over-the-ankle, ‘aggressive soled’ boots. My hiking boots rise about even with the ankle socket and Shannon’s a little lower. Before plunking down forty six bucks for the tour, we decided to ask if our gear passed muster. After consulting with the ticket booth attendant, two rangers and a tour leader we were told that our boots were ‘probably’ okay. Not a ringing endorsement, but not a ‘no’ either. Ultimately that day’s guide has sole discretion as to whether any individual is fit to go. We wouldn’t know for sure until she eye-balled us herself. We arrived the next morning at the appointed time, carefully scrutinizing other people’s footwear to see if we were the lone miscreants. Once the group assembled, our leader, Megan, gave us all the once-over. She zeroed in on a man with low-rise hiking shoes and told him he’d have to stay behind. Evacuating someone with a broken ankle through twisted and narrow subterranean passages wasn’t on her to-do list that day. We held our breath as Megan headed in our direction. She paused long enough to contemplate our clearly marginal Merrells before moving on. We were good to go. We outfitted ourselves with coveralls, kneepads, helmets and head-lamps. 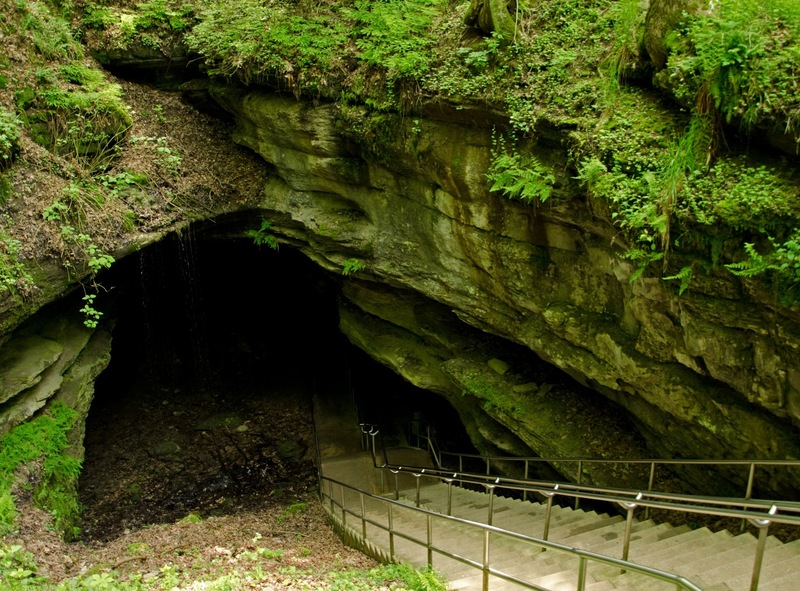 Feeling like miners, we boarded an old yellow school bus and rumbled to Mammoth Cave. Photo courtesy of Gary Berdeaux. We entered through one of the traditional openings and descended a metal staircase down what felt like several stories. At the bottom, we turned off the well-hewn path and toward our first test. A small gap in the rock required some twisting and searching for hand and footholds to navigate. On the other side, a small chamber lit only by the glow of headlamps. We were given one last chance to turn back. No one from our group did. With Megan leading the way we pushed further off the trail and into the wilds of the underdark. Even with our small group of 10, most of us were rarely within sight of our guide. The narrows of the cave system required single file passage. Our only knowledge of what lay ahead was what the person immediately in front of us disclosed. In such an environment, teamwork is essential. We utilized a form of ‘telephone’ to pass messages back from the guide and to communicate whatever useful information we discovered in tackling an obstacle: a good handhold here, a loose rock there. It’s a system that worked surprisingly better than the childhood game; probably because our guides took zero chances, external appearances notwithstanding. A second park ranger, one endowed with leprechaunian powers, mostly followed the group from the rear. But Jen had the seemingly magical ability to appear anywhere, and everywhere; one moment trailing behind, the next sitting high above watching from the shadows. As much as those of us in the middle of the pack felt isolated from our guides, they were always near. It was Jen who dispelled any notion that we were in a safe, theme-park environment. Tasked with ‘canyon walking’ along a shallow crevasse, we were given careful instructions. A lanky teen, who thought he knew best, successfully traversed the chasm his own way. Instead of praise for his ingenuity, he received a quick and public dressing down. He not only put himself at risk, but also those behind him who may follow his example. The game of telephone had seriously broken down, and that wouldn’t be tolerated. After a couple hours of stooping, crawling, twisting and contorting through Mammoth Cave I was tired and slightly banged up. So it was with mixed emotion that I learned the next obstacle was our last: a key hole opening so narrow we’d need to turn our heads sideways to get our helmets through. Too small to permit crawling, we had to find handholds and pull ourselves along flat on our stomachs. Conveniently, nightly rain had made its way to this part of the cave and collected in a muddy puddle directly in front of our only exit. Icing on the cake. Ten entered Mammoth Cave and ten safely returned. None were lost and none were injured; a credit to our guides and our group. More than that, though, it was an incredible experience and one of the most unique tours we’ve ever taken. In fact, we’re hooked. 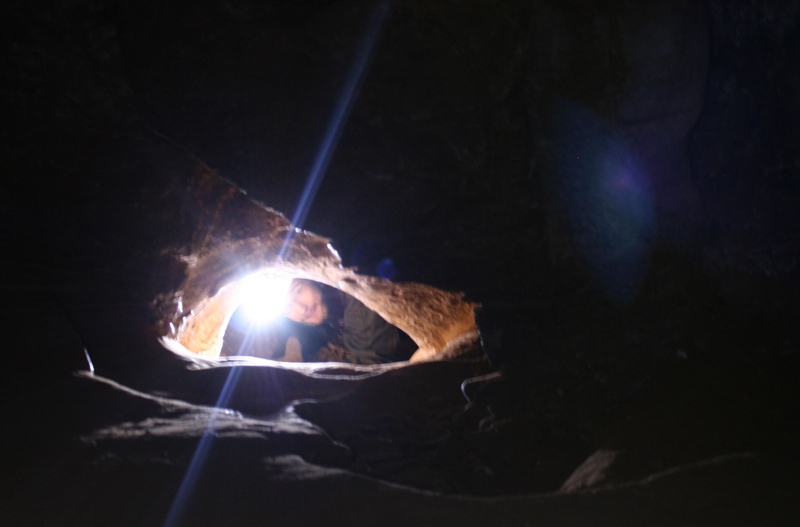 Already we’re planning a similar crawl and slither through Wind Cave in South Dakota and maybe some others beyond. Make sure you hit Waitomo caves in New Zealand for the black water rafting. Can’t wait to get to New Zealand. But long before we hit Waitomo, we’re planning a visit to Wind Cave in South Dakota and then the Actun Tunichil Muknal cave in Belize, where we’ll have a 40 minute jungle hike to the entrance, and then a swim through the ‘wet’ part of the cave. There are a bunch of places to go on similar trips. We’re hitting Wind Cave in SD soon and Jewel Cave looks pretty neat too. Wow, this sounds great! I would love to take a cave tour someday. I only briefly visited the interior of one when I was in Cuba, but crawling through one sounds far more exciting! It’s really a very different experience, and well worth the effort. When you’re crawling through holes with only your helmet light for illumination you really feel like you’re someplace completely different, and someplace few other people have been. We’re very glad we did it and can’t wait to do it again. I admire your bravery! I think I would feel incredibly claustrophobic, but to see those dark interiors, almost of another world, I bet makes the crawling worth it. Certainly not for the claustrophobic. But if you can get past the tight spaces, it really is like exploring a completely different world. So worth it. I just read this…I held my breath while reading it! 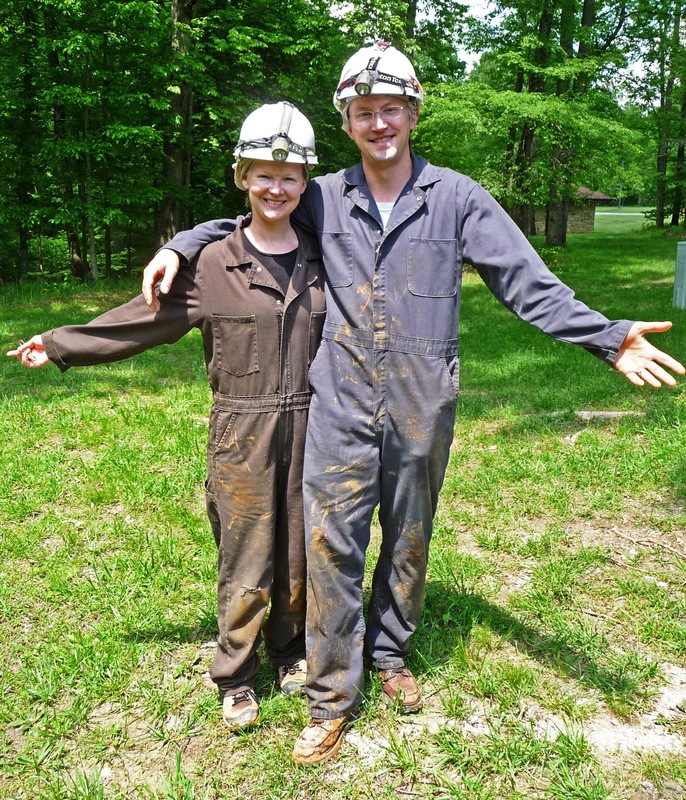 You guys are brave, but then far younger than my husband and I…we visited Mammoth Cave in 2012, but took the “easy” and short tour! This is super! If you get a chance, go caving in Khao Sok National Park in Thailand where no careful instructions will be given but the experience is just as exciting (and safe..?!). You have to swim for sections of it and the cold is an unpleasant shock from the humid rainforest, but the formations and waterfalls once you get into the caves compensate for the numb limbs.